The California Department of Toxic Substances Control (DTSC) has not issued a hazardous waste permit to Livermore Lab’s Site 300 since 1997. After a failed permit process in 2007, in which public comment was taken, but then abandoned and never responded to, DTSC has recently issued a new Draft Hazardous Waste Permit for Site 300. The High Explosives Testing done at Site 300 (in support of nuclear weapons development) produces significant quantities of hazardous waste, which contains or is contaminated with high explosives and a slurry of other toxins. Much of these wastes are burned in on-site incinerators. Site 300 is a Superfund site, with serious contamination from historical mismanagement of hazardous waste. The hazardous waste operations continue to threaten the environment and human health. A public hearing was held in Tracy on April 27th in which the present community was given a short presentation and allowed to ask questions. The DTSC was unable to answer many of the questions. Comments were taken on the record. The public now has until Friday, July 1st to submit their written comment to the DTSC. Tri-Valley CAREs submitted a formal written request to extend the comment period to this date. That extension was granted. Written comments are to be postmarked or emailed by July 1, 2016 and sent to: Alejandro Galdamez, Project Manager, DTSC Office of Permitting, 700 Heinz Avenue, Suite 300, Berkeley, California 94710 or via electronic mail at Alejandro.Galdamez@dtsc.ca.gov . Tri-Valley CAREs has drafted a short “sign and send” comment that you can sign and send electronically. Click here for an English version of the “sign and send” comment that you can download, print and mail in. Click here for an Spanish version of the “sign and send” comment that you can download, print and mail in. We are in the process of drafting more detailed comments. The situation in Ukraine is frightening on many fronts. The mainstream news severely censors the news, as it does on Fukushima. Fort Russ is one website translating and publishing articles on the situation. Global Research is another. There are 15 nuclear reactors operating in Ukraine right now — 6 reactors at Zaporozhye (and there has already been an accident there) and 2 at South Ukraine, both in the south eastern part of Ukraine. Imagine an accident at one or both of these plants. Peace in Ukraine and the cessation of US and Western support for the Kiev regime that has brought about this dangerous state of affairs has to be a top priority. When just one reactor at Chernobyl in Ukraine erupted in 1986, the land as far away as North Wales was so severely contaminated that the dairy industry to this day continues to be impacted and monitored. The situation in Ukraine continues to be alarming, and, unfortunately, does not create hope and optimism. The state under the control of the coup is rapidly approaching collapse on all fronts. In this sense, unfortunately, the threat is not only to the State of the country or the welfare of its inhabitants, but also the lives of millions of people, and not only in Ukraine. The Kiev government largely does not control the situation in Ukraine, does not control its own militants, and cannot prevent many emergencies, among which the safety of Ukrainian Nuclear Power Plant has special status. This was discussed on the TV programme “Special Status” on the TV channel “Zvezda”, which the Ukrainian opposition politician Alexei Zhuravko participated in. “I am receiving disturbing information from Ukraine almost every day. The threat of a terrible collapse and many deaths exists. We mustn’t joke on the topic of nuclear plants. 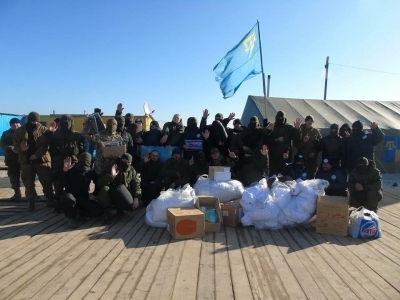 In addition, experts seak about one other threat: it is Islyamov, it is “Azov” militants, fighters of “Dnepr”. And no one knows where the gun will turn. The worst thing is that the safety of nuclear power plants, which was ensured by the State, internal security, no longer exists. That is, there is no protection, there are no guns that were defending the stations before, all was stolen, money for major repairs of the stations was looted, very little resources were allocated. In Zaporozhye, according to my real information, there was already a shutdown of this station, and it is linked with experiments. (I still have connections, I used to work with “Energoatom”) In this situation, we need to unite, to connect media, to reach out to the Ukrainians, otherwise there will be a disaster,” he said. Zhuravko doesn’t exclude that the fugitive Crimean Tatar terrorist Lenor Islyamov and his fighters, who have repeatedly threatened Russia with terrorist attacks, can bring his threats to life. Among those may be the explosion of nuclear facilities, nuclear power plants. “It is simple. If some fool will get guns and mortars, after that it can explode. It’s scary! If today Islyamov wants to blackmail Russia, he has everything to do it. He can order the militants to close the stations and just to install terror. Nuclear terror. Because in Ukraine, the President does not control the country! And this process must be controlled by specialists,” said the politician. “I ring all the bells around and I hope god will forbid those bastards from entering into nuclear power plant and chemical plant, and it’s just hard to imagine what the consequences and human toll would be,” adds Zhuravko. “If today Russia will not interpose, we will have such a blast that it will not look like something small. And it will be Belarus, Russia, Europe, and other countries that will suffer the most! It is necessary to “rear up” Europe… it is necessary to inform Ukrainians, it is necessary to show and to tell the truth on this matter. And to prove to people that they need to rise because a catastrophe will whip up, and humanity will be no more. Think about it for the time being it’s not too late,” warns the politician. At this time, in the South of Ukraine, armed militants that are massively deployed in the region, continue criminal terror. According to Zhuravko, robbery of the population gains the scope of this disaster. “Kherson region. 50 people armed to the teeth took away the farmer’s tractor, covers, chemicals, and seed material to the amount of twelve million hryvnias. Mykolaiv region, Bashtansky district, 25th June 2016, 40 people armed with machine guns and other machetes seized the entire crop from this year. According to available information, in Ukraine, on the black market and near the area of the ATO, you can buy any kind of weapons, machine guns, grenades, machine guns, explosives, anti-tank mines, and more. Private territorial battalions in Ukraine are growing like mushrooms after rain. The example of Isylamov’s battalions and their ISIS-isation of the Kherson region is already enough of a problem. The President does not control the situation in Ukraine, the Security Service of Ukraine is not fighting against private territorial battalions with radical ideas, and are not fighting terrorism,” writes the ex-MP on a social network. Alexei Zhuravko’s data was unexpectedly confirmed by the famous Ukrainian militant, leader of “Brotherhood” Dmitry Korchinskiy. Battalions under the leadership of businessman Lenur Islyamov, formed on the border with Crimea in Kherson region, are engaged in robbery, he said to the TV channel “112 Ukraine”. “They have already proclaimed the necessity of national autonomy of the Crimean Tatars, without asking the Ukrainian people. Crimean Tatars, even in the times of Geray (dynasty of Kahn in the 15th Century – O.R), were not a majority in Crimea. And today they say that Crimea should be a national autonomy of Crimean Tatars! Today in two districts in Kherson region… Tatars under the command of Lenur Islyamov, the former Deputy Prime Minister of the occupational government of Crimea, already have military formations that are very well armed, and are also engaged in robbery and all sorts of boorishness,” said Korchinskiy. On June 21, 2016, Friends of the Earth sent out an email entitled “BREAKING: Huge victory for renewable energy” and congratulating themselves for closing Diablo Canyon. The problem is, it wasn’t true. With no link in the email for more information, an internet search finally located the press release from FOE with the details and agreement documents. [i] They reveal a different picture. Yes, Friends of the Earth, in partnership with NRDC and other groups, negotiated a closure of Diablo Canyon, but it won’t happen for 9 years – in 2025. That is a catastrophe, not a victory. The group is now lobbying the CPUC to accept this agreement and lobbying the California Lands Commission to give a “short-term” extension of PG&E’s lease of the land until that time. Well-known names are missing from this agreement, names such as Greenpeace, Physicians for Social Responsibility, San Luis Obispo Mothers for Peace, Committee to Bridge the Gap, the Northern Chumash Tribal Council, Beyond Nuclear, Ecological Options Network, Nuclear Information and Resource Service, Nuclear Hotseat, Public Citizen, Food and Water Watch, Tri-Valley CAREs, even Union of Concerned Scientists, and Sierra Club. They’re not there for one reason: this agreement lacks integrity and realism. The only parties to the agreement are Friends of the Earth, Natural Resources Defense Council, Alliance for Nuclear Responsibility, PG&E, International Brotherhood of Electrical Workers Local 1245 (IBEW), Coalition of California Utility Employees, and Environment California It’s worth noting that Alliance for Nuclear Responsibility is also supporting SB 968, Sen. Bill Monning’s bill. Where did that go? This is not just a 180 degree turn. This is betrayal. Their letter to the California Lands Commission called Diablo Canyon Nuclear Power Plant a “GHG free generation resource” and states it doesn’t generate any greenhouse gas emissions—incredibly inaccurate but characteristic of nuclear industry propaganda. The letter says granting an extension to the lease would “directly promote California’s GHG emission reduction,” ignoring the danger of its continued operation every day which could destroy any future for California. IBEW got a guarantee in the agreement of $350 million for Diablo Canyon employees’ severance, retention, and retraining. Wow! What an amazing per-employee expenditure. Further, any approval by the CPUC has a condition that the approval cannot be appealed. This is appalling, and the reasons behind this derailment can only be guessed. The organizations that refused to participate in this charade, that are opposing SB 968 in Sacramento, and that continue to fight to close Diablo Canyon should be applauded and supported. Diablo Canyon is a ticking time bomb that endangers all life in Central California (and beyond) every day. This agreement gives Diablo Canyon and PG&E a pass for 9 long years. That isn’t progress. That is dangerous, fool-hardy denial, playing with nuclear catastrophe. With friends like these, who needs enemies? Friend or FOE? The answer is clear. Fukushima-harvested rice will hit the stores in Britain in July, which might make it the first member of the EU to import the grain, following a sustained effort by a group of Fukushima natives in London fighting rumors about the safety of the crop. It is also the third nation, after Singapore and Malaysia, to import Fukushima rice since the March 2011 earthquake and tsunami caused three reactor meltdowns at the Fukushima No. 1 nuclear plant. Starting next month, 1.9 tons of Fukushima rice called Ten no Tsubu will be sold in London. A Fukushima branch of National Federation of Agricultural Cooperative Associations, a Japanese farmers group better known as Zen-Noh, will export the rice via a British trading company. “With the U.K. as a foothold, we hope to expand the sale of prefecture-produced rice to other EU member countries,” said Nobuo Ohashi, who heads the Fukushima branch of Zen-Noh. According to Japan’s Agriculture, Forestry and Fisheries Ministry, the EU has been phasing out its ban on Fukushima food products since the nuclear disaster started. But for Fukushima rice, the EU still obliges importers to submit a radiation test certified by the Japanese government or sample tests by the member nation importing it. There were many hurdles to overcome. Amid fears that Fukushima products were tainted with radioactive fallout, Yoshiro Mitsuyama, who heads the Fukushima group in London, consulted an official at Zen-Noh’s branch in Germany on how to sell Fukushima products a few years ago. With the help of Zen-Noh, Mitsuyama’s group started selling Fukushima-made rice, peach and apple juice at the annual Japan Matsuri held at London’s Trafalgar Square three years ago. The products were popular with London residents. When Visit Japan Ambassador Martin Barrow came to Fukushima last April, he bought some local produce. “I want to help sell Fukushima fruits like cherries, apples and pears in London as well, not just rice,” said Mitsuyama. This section, appearing every third Monday, features topics and issues covered by the Fukushima Minpo, the largest newspaper in Fukushima Prefecture. The original article was published on May 25. The hearing starts at 1:30 pm. The public may attend and give testimony on opposition to this bill. S.B.No. 968 Monning.Diablo Canyon Units 1 and 2 powerplant. SB 968 passed the California Senate on June 1. It is now in the state Assembly and has had a first reading. There were a few text changes but not those requested by Mothers for Peace. Interestingly, a provision for public hearings has been eliminated from the bill. Not all data has been validated by the authorities that supplied them. Note the European Commission’s disclaimer, as well as my own disclaimer. Data Source used: EURDEP‘s public “Advanced Map”. See Online Radiation Monitors for that and many other options. Scroll down for the two beta radiation data graphs (at the end of this blog post). The below graphs show three 1-month radiation graphs pasted together (3 months per line), in no particular order. The exact location can be found with the coordinates listed unde the monitor name. This adds to many months of documentations that without any doubt: Something’s up!